“Look at the popcorn trees, Momma!” exclaimed my three-year-old as she scrambled out of bed and up the windowsill. The white blossoms popping on the branches peeked into her second-story window like something out of a Dr. Seuss book, reflecting astonishment in her baby blue eyes. “We can eat the trees! Let’s go pick some popcorn!” On that magical spring morning eighteen years ago, the wonder of nature sprang forth and lured me down the ubiquitous garden path that has beckoned throughout my life. It was predestined, I suppose. My father was raised on a farm, and although he shunned that life as a young adult, gardening is deeply embedded in his heart. It must be a recessive gene in my DNA, however, because I was not naturally drawn to the care and keeping of plants. Nor was I particularly excited about visiting my uncle’s farm during childhood vacations – the pigs were stinking muddy, the chickens were pecking mean, and the fields were sweltering dusty. But I remember how savory the sun-ripened tomatoes tasted, sprinkled with a little salt. And I recollect some lively watermelon seed spitting contests with the cousins, mouthwatering juice dripping down our chins. At home, helping my dad in our backyard garden seemed more of a chore than a delight. My horticulture career died on the vine one hot summer day when I picked a basket of peppers and ran howling to the nearest water hose after rubbing my eyes with fiery chili-stained fingers. I steered clear of the pepper patch after that, and I finagled my way out of most of the yard work with the blessing of a Bermuda grass allergy. But oh, the fruit trees were glorious, and they nudged me down the garden path ever so gently. Playing under the orange tree with its heady scent was intoxicating as we sipped nectar from the little fairy teacup blossoms. And breaking in the middle of kick-the-can games to pluck a few figs fresh off the tree after they had been warmed to juicy perfection in the afternoon sun was pure harvest nirvana. Unfortunately, my interest in plants shriveled to dormancy after its brief childhood debut. Teenage life in the 1970’s was consumed with the cultivation of friends, and I was much more inclined to munch on slices of pizza at the local parlor or wolf down burgers at the trendy new McDonalds rather than nibble veggies off the vine. The material 1980’s were spent wining and dining with nary a garden bed in sight. Perhaps it was buying our first house as a young married couple that renewed my appreciation for vegetation. Succulent ice plants proliferated around the pool in our Southern California backyard, and my gardening prowess grew as I trimmed those exuberant vines like a squatter in the rice paddies during my childbearing years. 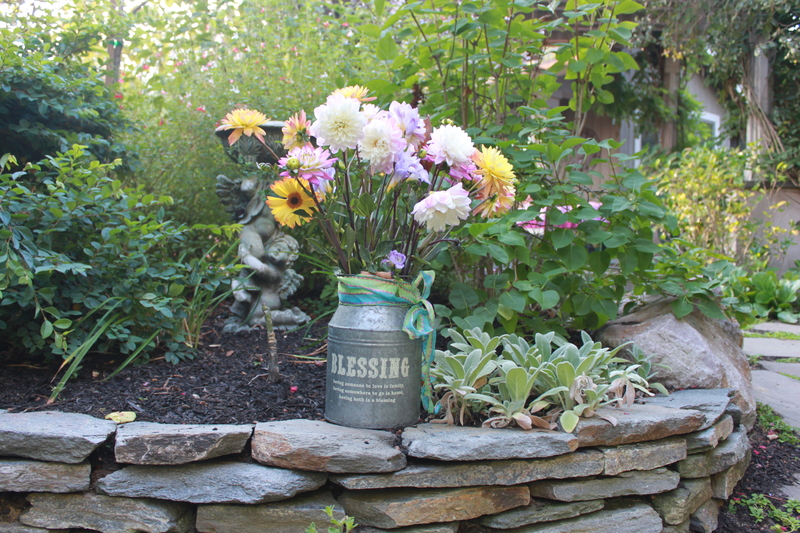 Nurturing patio pots that exploded with flowers was a tranquil respite from juggling three rambunctious babies. The zen of gardening began to whisper in my ears. Those whispers in transition to becoming a gardener spoke a little more insistently when we moved to Northern California, home to the revolutionary foodie Alice Waters. She planted the seeds of enlightenment in the 1990’s as the organic farm-to-table food movement was taking root in the East Bay’s fertile ground. Yet still I did not embrace the grow-your-own concept like two of my friends who rented plots in a community garden and raised their toddlers alongside their crops. Instead, my husband and I were wrestling with our unruly backyard that needed a hefty dose of nourishment. We yanked out dying plants, lumbered around the sprawling grounds with wheelbarrows of mulch, and attacked the rocky soil with hoes. We shoveled drought-tolerant plants into the hillside only to wake up to the demure deer munching our hard work down to the roots. This went on for eight years until we decided to stop fighting with the flora and fauna by hiring professional landscapers for a complete overhaul of our outdoor hang-out. Suddenly I discovered the true meditative quality of gardening, tapping into a soulful peace as I meandered through the paths and hideaways of our revamped yard. But the most surprising transformation evolved from the vegetable patch we carved out of the back forty behind the cabana. For a decade I dabbled with a variety of veggies, but the only real success came from the Italian section of tomatoes and herbs. My culinary specialty was tomatoes-basil-mozzarella drizzled with olive oil and balsamic vinegar – scrumptious but not much variety. This caliber of gardening might have continued for the rest of my life if not for my popcorn-tree daughter and farming papa. It is amazing how your children and parents can collectively instigate the most profound evolutions. My daughter moved back home after college with a genuine interest in our back forty at the same time that my folks came to visit last fall, and the sprouts of my gardening life received a rejuvenating blast of fertilizer. We found ourselves making plans for a winter vegetable patch – me, an avowed fair-weather gardener. With my father’s expertise, we planted lettuce, arugula, Swiss chard, beets, celery, carrots, radishes, onions, and snap peas. A farm-to-table milestone was achieved when I harvested the ingredients for a sixteen-person dinner party fresh from my little plot. We have since started composting, the mark of bona fide gardening in my estimation. The final push in this lifelong transition came when the American Association of University Women asked to put our home on the annual spring garden tour, which I have ardently attended for years. Ha! Imagine me dispensing horticulture advice – a true metamorphosis. 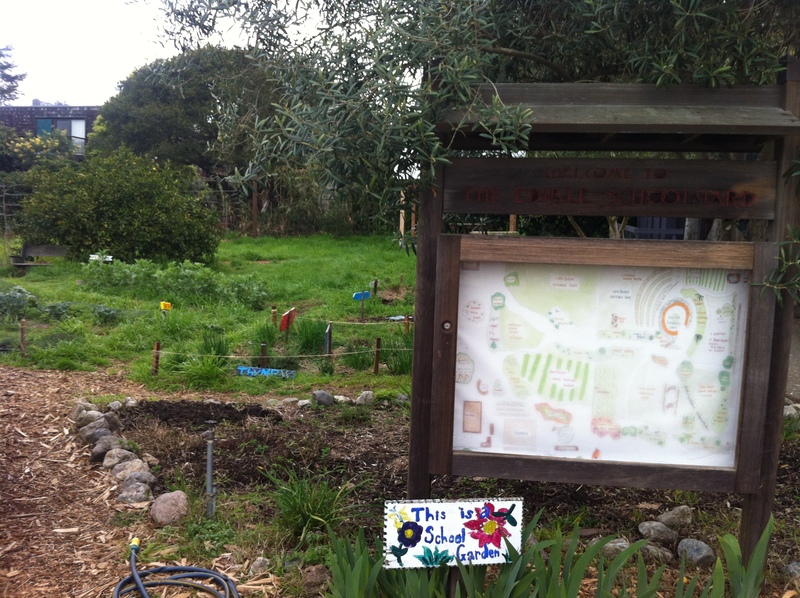 In solidarity of my transition to a full-fledged gardener, I spent a chilly winter morning touring Alice Water’s Edible Schoolyard that has been seventeen years in the making. Back in 1996 she took it upon herself to transform Berkeley’s blighted Martin Luther King Middle School into a sustainable urban oasis. Alice didn’t set out to revolutionize anything; she was simply trying to make her corner of the world a better place. Her goal was to give the children an understanding of where our food comes from and show them the human connection of growing, preparing, and enjoying food together as a community. By integrating lessons from the garden and kitchen into the curriculum, she designed a program that involves students in the whole cycle, encouraging them to buy into the concepts of healthy eating and sustainable living. Through trials and errors and intermittent successes, this one-acre cement wasteland gradually evolved into a vibrant model of urban school gardening. The best advice from the tour: Take It Slowly. Transitions and victories rarely happen overnight. The process of creating a fertile garden requires bushels of attention, just as the process of becoming a gardener takes many seasons to ripen. I have traipsed far down the garden path, and my green thumb is finally beginning to blossom like those magical popcorn trees. In this unsettled world we live in full of shootings, nuclear threats, economic woes, and global warming, it’s important for us all to find a little patch of paradise – a place that we can nurture, control, and create solace. There is something so rewarding about growing plants to fruition and enjoying the fruits of that labor. Everyone should try a little gardening, if only for a peaceful distraction from the stresses of life. Start small. A tomato plant and some basil in a pot by the kitchen door will bring great rewards in summer, and it just may turn into a lifetime of green adventures and victory gardens. ‘Il dolci far niente’ is stale, and the time for dreaming is ‘finito’. Dreams are essential for a fulfilling life, but if those dreams never come true, how gratifiying is that? And how can dreams become reality if we forever wallow in ‘the sweetness of doing nothing’ instead of taking action to bring those dreams to fruition? In every life there are pivot points – words that speak to us, events that spur us to action, emotions that ignite a passion so burning that it can’t be snuffed. I was spinning on a pivot point this past weekend, doing my best to stay upright in my wobbly pirouette, and it’s a relief to find that I’m still standing now that the twirling has stopped. An air of dizziness still surrounds me, but that’s more like my everyday blonde trying-to-do-too-much condition. Why do writers feel compelled to write? Why We Write is the perfect book for frustrated writers, and I keep it on my desk to pick up whenever I slam into a wall. It has a great quote by David Baldacci: “If writing were illegal, I’d be in prison. I can’t not write. It’s a compulsion. When the sentences and the story are flowing, writing is better than any drug. It doesn’t just make you feel good about yourself. It makes you feel good about everything.” I’m no Baldacci – if writing were illegal, I would probably never lift a pen, coward that I am. But I understand the compulsiveness of it, and I’m starting to feel glimmers of feeling good as a result of it. Another trusty companion book, Anne Lamott’s Bird by Bird, comforts me with this quote: “Very few writers know what they are doing until they’ve done it. Nor do they go about their business feeling dewy and thrilled. They do not type a few stiff warm-up sentences and then find themselves bounding along like huskies across the snow. One writer I know tells me that he sits down every morning and says to himself nicely, ‘It’s not like you don’t have a choice, because you do – you can either type or kill yourself.’” I feel ever so much better knowing that if I never wrote again I certainly wouldn’t kill myself and would continue to live happily. At least I’m not a tormented artist. But I do feel inexplicably compelled to write. After the first two head-spinning days of the Conference, there was a slow build of inspiration and profound clarity on the third day. Bonding with other writers – including published authors who continue to seek guidance and wisdom – was reassuring. Consulting with editors who found good in my work – and gave me “A-ha!” advice on the bad – was illuminating. 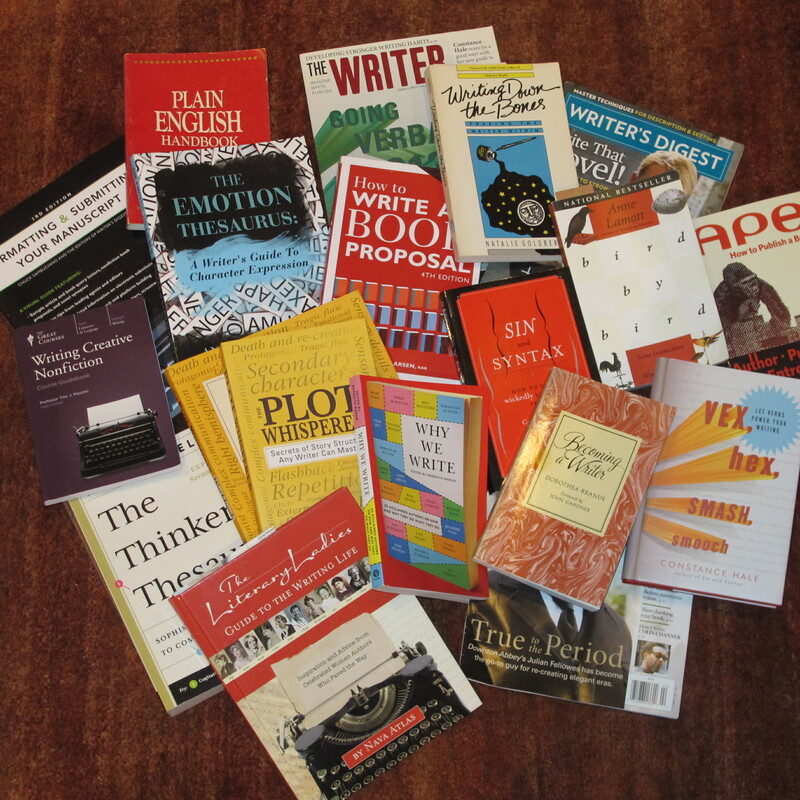 Meeting big scary literary agents – who of course are just regular people like the rest of us – was insightful because they want to find a good story to sell (almost) as much as we writers want to write that good story. It began to feel like we were enveloped in a cocoon of encouragement and support. After being buried alive in a pile of Writing Advice, I dug my way up and poked my head out the top to greet the light where it all came together in one cohesive, simple message: “JUST WRITE!” The last day of the conference created a feeling of empowerment as I realized that there really are no rules, no rhyme, and no reason to what makes a bestseller or a book worth reading. After taking copious notes and learning an abundance of valuable knowledge, I came to the conclusion that the most important thing is to write with passion and write with ferocity… every single day. Now that this vast collection of writing and publishing information has been assimilated in my twirly little mind, I can forge ahead. Whatever your dream – to run a marathon on the Great Wall, start your own business, grow a vegetable garden, sail around the Greek Islands, appear in an off-Broadway play, lose 100 pounds, get off the grid, cure the common cold, learn to sculpt, be on a reality show, design an ipad app, cook a soufflé, become a Red Cross volunteer, party at Burning Man, find your biological mother, see the earth from space, become a doctor, survive in the wilderness for a month, be a ninja, knit an afghan, hang out with Bruce Springsteen, jump from an airplane, live in Italy, or even win the lottery – just remember that it won’t happen simply by sitting around dreaming about it. Praying may help, but it won’t cause it to happen. And believe it or not, it won’t magically occur with the Law of Attraction theory of “putting it out to the world” (as much as I believe in that theory too). To make our dreams a reality, we must PLOT it. Make a plan, strategize, do the things to put the wheels in motion. We must dream up the idea, create the storyline, and above all stick to the plot! HOME just may be one of the most emotional words in the English language. This simple four-letter word evokes complex sentiments – misty-eyed memories, frustrated anger, adolescent angst, deep and utter contentment. Thousands of songs have been written on the subject; I know because I recently made a playlist of forty-eight songs about home, and those are just the ones that I like. Home is a structure, a place, a feeling, maybe even a person. Home is not just where your heart is – it is IN your heart. Home may not be a necessity for human survival, but it is vital for human happiness. And since we can’t always control the home we live in, we have to make happy homes in our hearts. It seems like home should be a solid, unchanging entity, but in reality, homes are in a constant state of flux. I suppose the home I grew up in is the epitome of the word home. My parents have lived there for fifty-three years now, and aside from a few minor changes, it looks and feels relatively the same as it did for the eighteen years I spent my childhood in it. The great Mulberry Tree I loved to climb has been chopped down, the succulent fig tree we plucked warm juicy figs from on hot summer days bit the dust, and long gone is the zipline that spanned our backyard. But the playhouse my dad built still stands proud even though it’s filled with gardening junk, and my old bedspread still covers my little twin bed although my mother thankfully painted out those bright orange walls that illuminated my teen years. My childhood home was the simplest of homes – a humble structure filled with pure, quiet love. Perhaps that is the secret to its longevity. I left my childhood home to go to college in California and essentially never moved back. Since then I have lived in a variety of homes, as have most of us over-thirty-somethings. 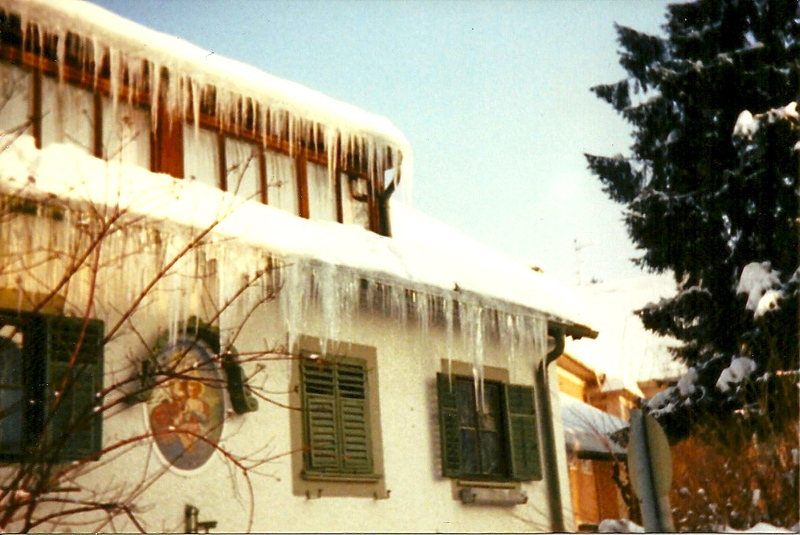 The fun and funky Haus Wartenberg that I resided in during my study abroad in Salzburg wins the prize for the most distinctive home of my life. This traditional European house was built in 1654 and is located in the heart of Salzburg, one of the coolest medieval towns in the world, no exaggeration. It was my home-away-from-home for five magical months, and I have nothing but the fondest of memories from this quirky old place. The Salzburg Semester has been a beloved program at the University of Redlands for over fifty years, and I was fortunate to be among the group of thirty-five students during the Fall of ’81. I lived up in the penthouse suite with four friends, where the bathroom ceiling was sloped so low that we could barely stand upright, which is probably why we washed our hair maybe once a week and shaved our legs even less frequently. I loved the skylight window in the slanted ceiling above my bed where I spent hours daydreaming and gazing at the amazing Austrian scenery when I should have been studying my paltry German and European History. We all lived, studied, and made a lot of mischief in Haus Wartenberg, but our home-away-from-this-home was the Augustiner Bräustübl, the legendary local beer hall famous for its beers, brats and bosnas. The biggest accomplishment that was a must for every merrymaker on the program was to become a member of the Fünf Liter Club, which entailed drinking five liters of beer in one sitting. Heck yes, I joined this illustrious club one murky night, securing my rightful place in the Aug family home. 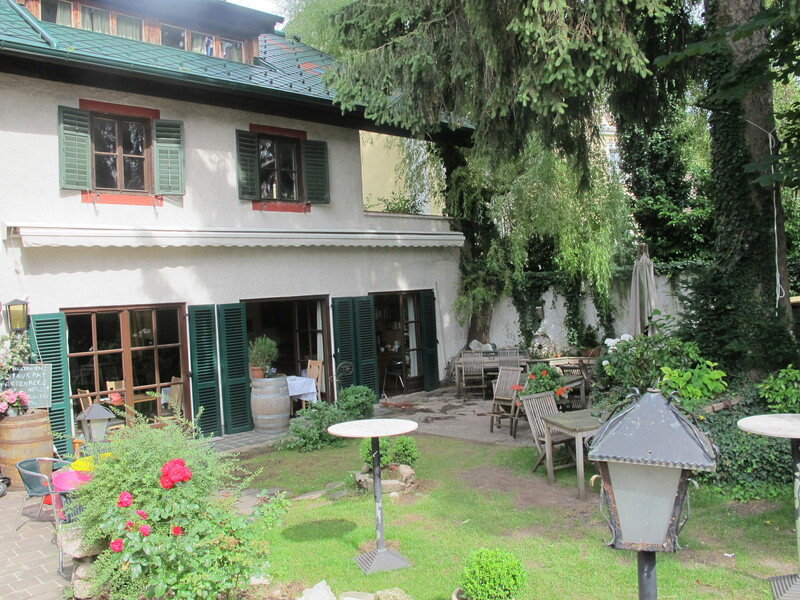 Was it any wonder that I wanted to re-visit these sentimental old homes – both Haus Wartenberg and the Aug – on a recent family vacation to Austria? I hadn’t been back to Salzburg in over thirty years, but that woozy comfy feeling of home flooded my heart as we drove into town. We stepped it up a notch and stayed at the exquisite Hotel Schloss Mönchstein on top of the Mönchsberg, a place I never even dreamed of back in my college days. And although I needed a map to sniff out my way back to the Aug, the smell of beer and bosnas nearly took my breath away the second I walked in. Home. 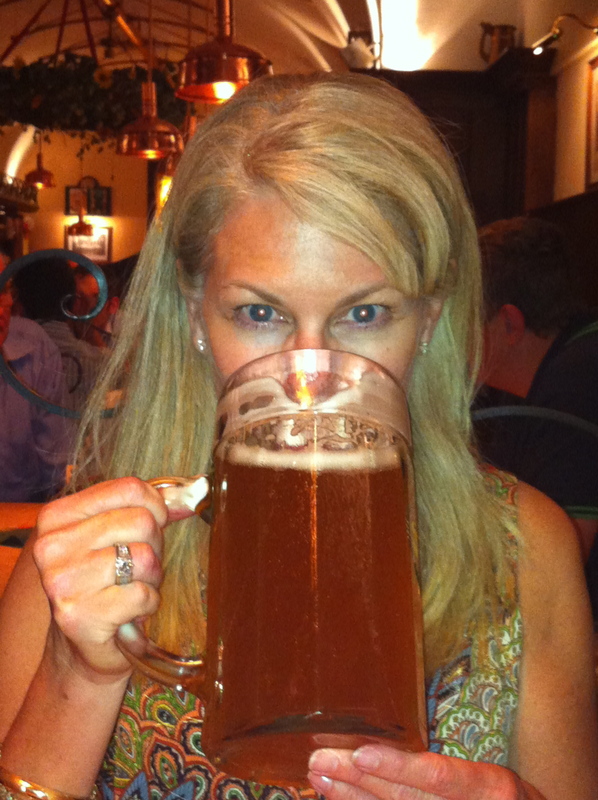 My dreams of re-visiting the Fünf Liter Club, however, were dashed immediately after I ordered einem liter of beer. Holy cow, how did one scrawny girl drink five of those things? You can definitely go back home, but it might be a good idea to temper your expectations of that mystical place. The next day, my expectations were firmly in check as I took my daughters to see Haus Wartenberg. I really had no idea what to expect. I knew that the U of R Salzburg Program stopped using the old house years ago and I knew that it was now a family-owned hotel, but that was the extent of my knowledge. It was surreal that I had to consult with my iphone to find the place that I used to find my way home to on the murkiest of nights, especially since the only phone available back then to call home was in the post office. But the second we stumbled upon my old Haus, the old feelings welled up all over again. It looked amazingly the same as it did thirty years ago, greeted as we were with the peaceful courtyard shaded by huge old trees. With the exception of the word “Hotel” written above Haus Wartenberg on the entrance sign and the Italian ristorante converted to a classic Austrian eatery, it was all just as I remembered it, down to the worn and musty antique furnishings. We wandered upstairs as if in a dream and were greeted warmly by the manager. He gave us the “grand tour” complete with a sneak peek at the penthouse suite that was my home. I could hardly breathe, feeling like I was twenty-one all over again. It was all so familiar in a faraway kind of way. My girls and I decided that we would have to step back down off the glitzy Mönchsberg and stay at Hotel Haus Wartenberg the next time we come home to Salzburg. My thoughts have been strongly focused on home during this time of transition at 2377 Hagen Oaks. So many comings and goings. Our homeless son-for-a-year moving out as he heads off to college. 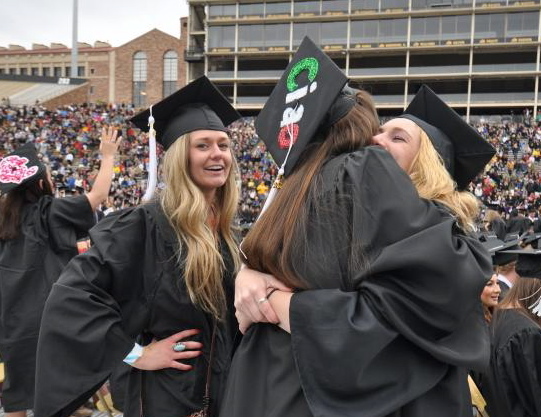 Our middle child moving back home after her college graduation from her Boulder home. Our oldest child coming home from Chicago to visit, filling the house with all three children for one precious weekend. Our youngest child moving to her Shanghai home for the semester. All of this movement begs the question: where is home? Home is in your heart, and you can take it with you, wherever you may live. Make yours a happy home. Ciao bella! Life is an endless parade of goodbyes. That sounds like a real downer, but actually goodbyes are poignant celebrations, simply a way of letting go of one thing and greeting the next. Almost every significant event in our lives is bookmarked by the farewells we bid. Even moments of festivity are times of letting go. My daughter graduated from college last week, a joyous jubilee at the end of a four-year adventure and the beginning of a brand new journey. Goodbye to beautiful Boulder, one of the coolest towns around. Goodbye to the St. Julien Hotel where we’ve spent many lovely hours. 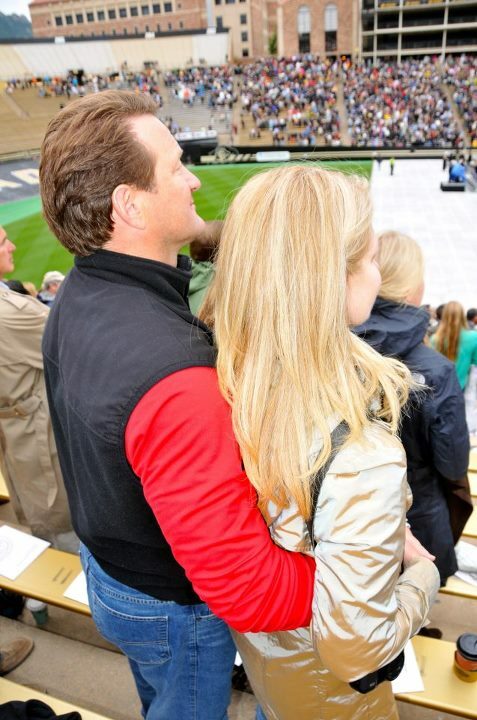 Goodbye to tuition payments – well, two down one to go. Hello to my grown-up child who now feels more like my friend than my kid. Hello to a world of possibilities. Haley’s History Department graduation held their intimate commencement in the most fitting setting of an outdoor amphitheater. It was a very proper ceremony that ended with touching comic irreverence. Go Now by The Moody Blues was the recessional march, and those wry history professors wished the graduates well by sending them on their merry way with an old classic goodbye song. Many tears have been shed at goodbyes during my life, but my eyes are relatively dry these days as I realize that goodbye doesn’t usually mean forever, at least in the scheme of eternity. Even the beloveds we have said goodbye to in this life will return to us someday in one form or another. I say goodbye an awful lot now to our three kids who all live out of state, which seems to get easier each time. My heart is full-to-bursting during the reunions with my children, so I’ve learned to just truly enjoy the time together without dreading the inevitable goodbye at the visit’s end. I actually appreciate the farewells because it gives me that glorious anticipation of our next reunion, and I’m learning to love farewells because that’s the way we get to say hello all over again. What we need is a happy word to say goodbye with. Italians and Hawaiians do it best by using the same word for hello and goodbye. Ciao. Aloha. Shalom does the same and softens the blow in Hebrew while Salaam does the trick in Arabic. We unromantic, bereft English speakers are sorely lacking an all-purpose word of greeting. Salut? Good day? Peace? Hey? Cheerio? Fare thee well, farewell… it’s time for a new way to say goodbye. When Tony hollers “Circle the Wagons”, I always cringe because I know that changes are a-comin’. He picked up that phrase in his early days on Wall Street when the head of trading would say it as a response to the market going crazy. Circle the Wagons has become one of our household mottos: it’s our signal to hold up and re-group to adapt to changing conditions, usually economic. We laugh about it, but I’m never happy to hear that phrase because it often puts a crimp in the existing contentment. The seeds of change are planted on the day we are born as one of the few certainties in life. The harvests we reap are the transformations that we go through in the course of our lives. Whether we purposefully and willingly take on change or have change thrust upon us due to circumstances beyond our control, it is as inevitable as death itself. We must change or bust. Andy Warhol said, “They say that time changes things, but actually you have to change them yourself.” Actually Andy, it’s a little of both. Things around us are constantly changing, and its up to us to adapt ourselves to those changes. It’s not necessarily survival of the fittest, but rather survival of the most adaptable. Why are people afraid of change, and why are we so resistant to such a natural part of living? The key to change is to let go of the fear and embrace the unknown. Times of transition open us up to new and wonderful possibilities, like the caterpillar-to-butterfly metamorphosis. How boring would life be if everything stayed the same? Life is fluid and constant motion, and we need to move and groove along with the waves or be sucked under the changing tides. Our planet is undergoing major transformations that have been brought on mainly through our own actions. And now it’s up to us to change our way of doing things to not only adapt to those changes but also to reverse them. Sustainability is a very big key to our long-term survival, and there are so many ways that we can each contribute to that goal. Install a tankless water heater, convert to solar power, drive a hybrid car, be a locavore eating locally-grown organic produce. We went wine tasting at Benziger Winery in Sonoma last weekend and were fascinated with their biodynamic agriculture. It goes beyond organic farming as a holistic approach to creating a balanced farm ecosystem that generates health and fertility from within the farm (or vineyard) itself, and herein lies the future of our planet’s restoration. On a personal level, I’m working to restore the balanced vitality of my body since I can’t shake the feeling that I dodged a melanoma bullet with my Harry Potter scar. Of course I’m counting my blessings and feeling very grateful for an early and clear diagnosis. But rather than sitting back and breathing a sigh of relief, I am learning about all the things I should change in my lifestyle to keep cancer cells at bay. For as open as I am to change, I must admit that I’m dragging my heels a bit on this one. No alcohol, no sugar, no fat, no massages, no steam rooms and jacuzzis, no sunshine, no air travel… this No List feels more like a death sentence than melanoma does. 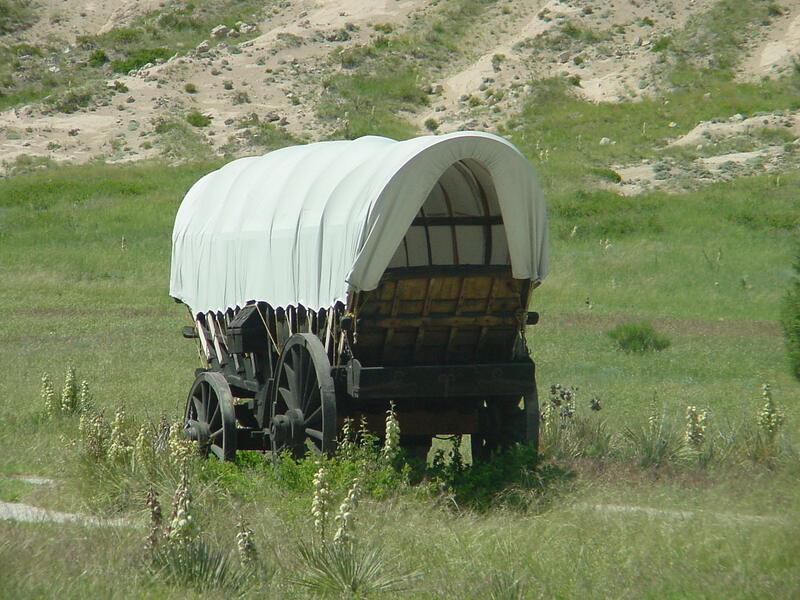 I don’t wanna circle the dang wagons… I’d rather go bust! Whoa there little filly… I must remind myself that the anticipated dread is usually far worse than the reality. The more I learn about the things we can do to keep those free radical cells from wrecking havoc in our bodies, the more I welcome this lifestyle change. So circle your wagon back in a week and we’ll delve into the anticancer metamorphosis that we should all embrace. Turn and face the strain… ch-ch-changes.